Business owners still have time to significantly reduce their tax bills for 2018. Here are seven year-end moves to consider, taking into account changes included in the Tax Cuts and Jobs Act (TCJA). Thanks to the TCJA, 100% first-year bonus depreciation is available for qualified new and used property that's acquired and placed in service in calendar year 2018. That means your business might be able to write off the entire cost of some (or all) of your 2018 asset additions on this year's return. Bonus depreciation isn't subject to any spending limits or income-based phaseout thresholds. But the program will be gradually phased out, starting in 2023, unless Congress extends it. Consider buying some extra equipment, furniture, computers or other fixed assets before year end. Your tax advisor can explain what types of assets qualify for this break. Heavy SUVs, pickups and vans that are used over 50% for business are treated for tax purposes as transportation equipment. So, they qualify for 100% bonus depreciation. Specifically, bonus depreciation is available when the SUV, pickup or van has a manufacturer's gross vehicle weight rating (GVWR) above 6,000 pounds. You can verify a vehicle's GVWR by looking at the manufacturer's label, which is usually found on the inside edge of the driver's side door (where the door hinges meet the frame). If your business needs a vehicle that meets these requirements and you place it in service before the end of this tax year, it could deliver a big write-off on your 2018 tax return. Other equipment used in the living quarters of a lodging facility or in connection with a lodging facility, such as a hotel, motel, apartment house, rental condo or rental single-family home. Qualifying real property. Sec. 179 expensing can be claimed for qualifying real property expenditures, up to the maximum annual allowance. The Sec. 179 allowance is $1 million for tax years beginning in 2018. There's no separate limit for qualifying real property expenditures, so Sec. 179 deductions claimed for real property reduce the maximum annual allowance dollar for dollar. Qualifying real property refers to any improvement to an interior portion of a nonresidential building that's placed in service after the date the building is first placed in service. However, costs attributable to the enlargement of a building, any elevator or escalator, or the building's internal structural framework don't qualify. For tax years beginning in 2018 and beyond, the TCJA expanded the definition of real property eligible for Sec. 179 expensing to include qualified expenditures for roofs, HVAC equipment, fire protection and alarm systems, and security systems for nonresidential real property. These items must be placed in service in tax years beginning after 2017, and after the nonresidential building has been placed in service. Important note: Various limitations apply to Sec. 179 expensing deductions, especially if you conduct your business as a so-called "pass-through entity" (including a partnership, S corporation or a limited liability company (LLC) that's treated as a partnership for tax purposes). Income and deductions from pass-through entities are allocated to the owners based on their ownership percentage in the business. Your pro rata share of a pass-through entity's net income is taxed at your personal rates. Under the TCJA, individual federal income tax rate brackets will basically be the same for 2018 and 2019, with modest adjustments for inflation. (See "2018 and 2019 Individual Tax Brackets" below.) So, the traditional strategy of deferring income into next year while accelerating deductible expenditures into this year makes sense if you expect to be in the same or lower tax bracket next year. Deferring income and accelerating deductions will, at a minimum, postpone part of your tax bill from 2018 until 2019. However, if you expect to be in a higher tax bracket in 2019, take the opposite approach. Accelerate income into this year (if possible) and postpone deductible expenditures until 2019. That way, more income will be taxed at this year's lower rate instead of next year's higher rate. The TCJA created a new deduction based on qualified business income (QBI) from pass-through entities. 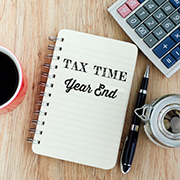 For tax years beginning in 2018 through 2025, the deduction can be up to 20% of a pass-through entity owner's QBI, subject to restrictions that can apply at higher income levels and another restriction based on the owner's taxable income. The QBI deduction is available only to noncorporate taxpayers, meaning individuals, trusts and estates. It also can be claimed for up to 20% of income from qualified real estate investment trust (REIT) dividends and 20% of qualified income from publicly traded partnerships (PTPs). Because of various limitations on the QBI deduction, tax planning can help increase your allowable QBI deduction. For example, before year end, you might be able to increase W-2 wages or purchase additional business assets to help boost your QBI deduction. Also, be aware that moves designed to reduce this year's taxable income (such as postponing revenue or accelerating expenses) can inadvertently reduce your QBI deduction. Work with your tax pro to anticipate any adverse side effects of other tax planning strategies and optimize your results on this year's return. If your business doesn't already have a retirement plan, it might be time to take the plunge. Current retirement plan rules allow for significant deductible contributions. For example, if you're self-employed and set up a SEP-IRA, you can contribute up to 20% of your self-employment earnings, with a maximum contribution of $55,000 for 2018. If you're employed by your own corporation, you can contribute up to 25% of your salary to your account, with a maximum contribution of $55,000. Other small business retirement plan options include defined benefit pension plans, SIMPLE-IRAs, and 401(k) plans. You can even set up a solo 401(k) plan for just one person. Depending on your circumstances, these other types of plans may allow bigger deductible contributions. Important note: If your business has employees, your plan may have to cover them, too. The deadline for setting up a SEP-IRA for a sole proprietorship business and making the initial deductible contribution for the 2018 tax year is October 15, 2019, if you extend your 2018 return to that date. Other plans generally must be established by December 31, 2018, if you want to make a deductible contribution for the 2018 tax year. But the deadline for the contribution itself is the extended due date for your 2018 return. There's one exception: To make a SIMPLE-IRA contribution for 2018, you must have set up the plan by October 1, 2018. So, you might have to wait until next year if you prefer the SIMPLE-IRA option. A 100% federal gain exclusion break is potentially available when you sell qualified small business corporation (QSBC) stock that was acquired after September 27, 2010. That equates to a 0% federal income tax rate if the shares are sold for a gain. However, you must hold the shares for more than five years to benefit from this break. Be aware that it's not available to QSBC stock that's owned by a C corporation. Plus, many companies won't meet the definition of a QSBC in the first place. Your tax professional can help explain the details. On the one hand, year-end tax planning for small businesses is easier for 2018 than for some previous years. That's because we know the federal income tax rates that will apply next year. On the other hand, this year's tax planning is complicated by all the tax law changes that take effect for tax years starting in 2018. Work with your tax pro to identify the best year-end strategies for your specific business situation.